In a world ruled by fear (no other emotions now exist), although violence is basically unheard of, people generally go through life keeping their heads down. A vial of blood and a cryptic page are thrust into Rom’s hands by a man on the run from authorities. The old man says something that makes Rom think his father didn’t live quite the straight-and-narrow life he’d always thought. But he doesn’t have long to think about it, now that he’s being pursued because of what he now possesses. This was, overall, an enjoyable read for me. I don’t always respect Dekker’s books much, but this is one of his better ones. He’s always been great at pacing, and this book is no exception. The story flies along, dragging the reader from one page to the next. Lee’s influence was clear — at times, the prose really sparkled, which is something I haven’t experienced in Dekker’s writing. Somehow, while feeling pretty unique, the whole dystopian setup also felt trite. There was also one scene, in particular, that was overwrought, more bloody than it needed to be. Maybe this will be sussed out in subsequent books, but as it stood in this one, it was out of place and gory. The part of the book that was most interesting to me was touched on immediately, on the first page of the first chapter: Art, any kind of creative pursuit, only barely survives in this world, and that only because a long-dead expert had written about the educational merits of the arts. The life of an artisan is hard, in a world unmoved by creativity. [Not that the life of an artist is exactly easy, even today.] Even then, “artisan” is a more accurate word than “artist” because the act of creation doesn’t really happen outside the full scope of emotion, which this population lacks. I love that one of the characteristics we as humans share with God is creativity. God created ex nihilo, and we, made in that image, create. I can easily see how art appreciation might not happen in a world without love or joy or even anger. But I hadn’t really thought about creating being an act that required emotional undercurrents. What do you think? Could an emotion-less being create? 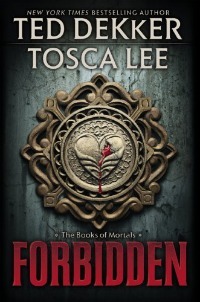 Book 2, Mortal, is schedule for release in September 2012; book 3, Sovereign, will be published in 2013. Ted Dekker is a bestselling author of more than 20 novels. He lives in Austin, Texas. Tosca Lee (@ToscaLee) is the author of Demon and Havah. I received this book from the publisher as part of the Faith and Fiction Round Table. I am an Amazon Associate and receive a small commission on sales through my affiliate links. This entry was posted in books, Christian Fiction, fiction, review, review copy, speculative and tagged dystopia, Faith 'n' Fiction Saturday, quote. Bookmark the permalink. I liked this one better than some of his more recent ones as well. I was nervous going in as I have been so disappointed with many of his and didnt know if I really wanted to put the time into another… but I was pleasantly surprised. You forgot me on your list 🙂 I posted last night. Oh yeah, creativity is huge for me on human skills! Maybe it’s because I was raised with arts and music or because I now work in education but for me, being alive and creating are one and the same! I love what you said about emotion and creativity. I’ve always wondered how different the world of art and literature and music might be if anti-depressants and mood-altering drugs had been readily available to artists and writers in history. Dekker actually spoke at SIBA and he is rather intense. I’ve read one of his books and it was pretty good. I haven’t felt compelled to read his others. Which one did you read? They actually vary quite a bit, at least historically. I finally bought one of his books, but it wasn’t this one. I think it’s Bride Collector. Lots of book bloggers like him so I want to give him a try. Bride Collector isn’t one of my favorites, but I hope you like it! Ted Dekker is awesome. I have read almost every one of his books, about 26 or 27 out of 37 or 38. He’s an incredible author, and knows how to put amazing emotion into stories. With this collaboration with Tosca Lee, it was spectacular. Sure, some scenes may seem overly bloody, but that is because they are trying to emphasize the villainous ways of people like Saric. I have a feeling this is going to be an incredibly great trilogy, and it seems intensely real. No cheesy lines like many other people have in their books.